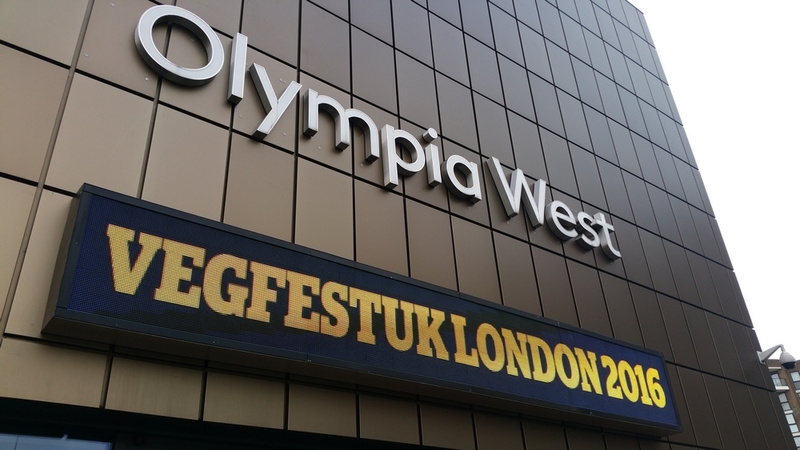 A couple of weeks ago, at the end of October 2016, we went to VegFest in London. This was a two day event at the Olympia Conference center, on Hammersmith Road (east London). It is not a free festival: we bought tickets in advance which were only £9 per person (buy one, get one half price). Tickets at the door were £15. We were especially interested in the Intersectionality Conference on Sunday. Arriving at the opening time of 11AM on Saturday, it became immediately clear that this is huge event! We found a long queue going round the block to get to the entrance at the west side of Olympia. We made good progress though, and after about only 10 minutes of queuing, scanning of our tickets and a security check, we could enter the venue. There were two large halls on the first floor, with dozens of stalls. The lectures were in the auditorium and conference rooms on the second floor, where there were also stalls from several NGO’s. The Olympia is a really well known venue, where conferences and other events take place. It is very spacious and bright place, with large elevators, catering facilities, plenty of (accessible) toilets and the stalls were orderly set up with identical ‘housing’ materials with a banner of the company or organisation logo on top. There was also plenty of staff around (security checks, operating the elevators etc). All of this gave it a very professional feeling, hats of to VegFestUK, the organisers! There was an amazing buzzing atmosphere. Next to the Pro-Intersectional conference, there was also a Vegan Atletes Summit, a Vegan Health Summit, and even a bodybuilding contest! And cookery demos and live music performances. There were of course plenty of food stalls, but also plenty of other items like vegan shoes, clothes, jewelry and body and care products, and some peculiarities like vegan mosquito repellant, or toe shoes. We did have some snacks during our two days at the conference, although queus for some of the foodstalls were really long. During our weekend stay in London, we also visited Nama Foods (blogpost here) , Vanilla Black (review following) and Thai Buffet (review following), so by the end of the weekend, we were really stuffed! We spent most of Saturday exploring the stalls, and although we were there from a little after 11AM til 5PM, it felt like we hadn’t covered the grounds properly! It was that big! We stopped at Animal Equality, and took a look at their iAnimal footage. 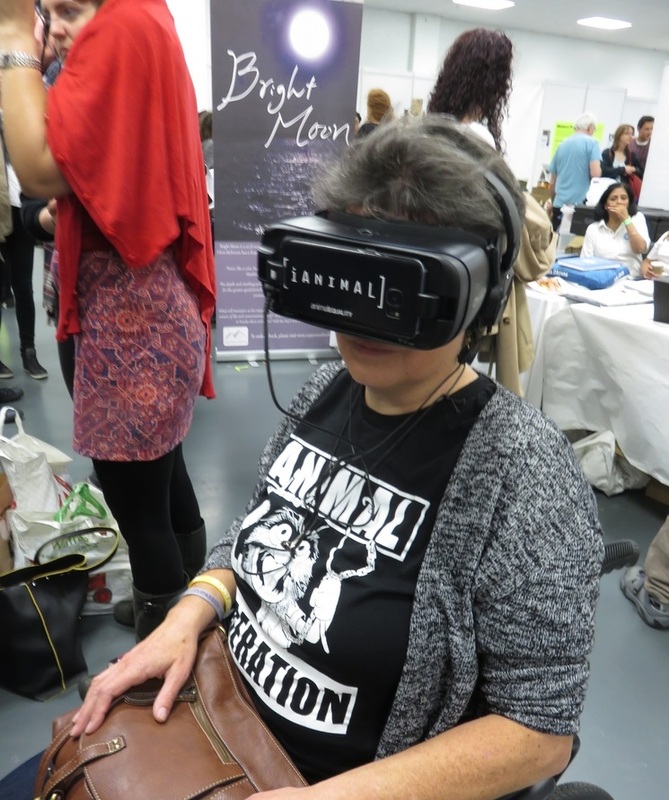 iAnimal is a virtual reality project that creates a 360 degree, immersive experience in which the viewer is transported inside factory farms and slaughterhouses. What I saw was footage from inside pig farms and a slaughterhouse, through the perspective of the animals. What makes the footage so special is that it is not simply 2D, but gives you a 360° look inside (when you move your head to look to the left or right, the perspective changes accordingly). It had been quite a while since I watched such footage (I feel like I have seen enough animal cruelty images … so I try to avoid looking at them) and it was really hard to watch. I hope this project opens lots of eys and hearts, and can inspire people to go vegan. We were really looking forward to the Pro-Intersectional Conference on Sunday, and that was also our main motivation to attend the festival in the first place. 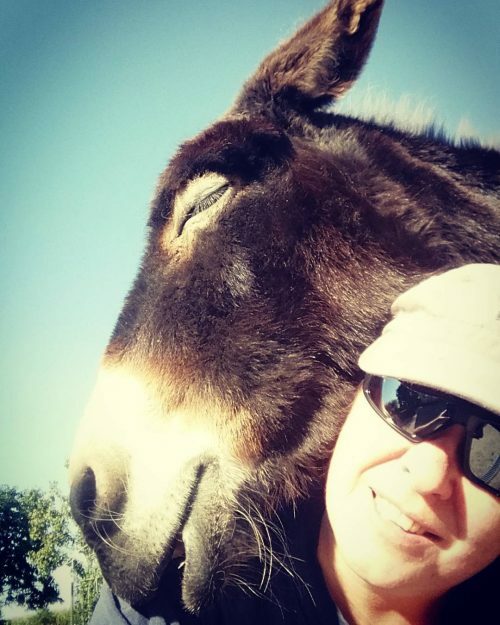 The concept of intersectionality is realizing the connectedness of the many oppressions and discriminations shaping our lives, not just among humans (racism, sexism, ableism, …) but also between humans and other animals (speciesism). Individuals belong to multiple oppressed or privileged groups and their experiences cannot be fully understood with a single-issue analysis. For example, the situation of women in society cannot be fully understood without also taking into account their other social identities (being poor, LBGTQ, …). On the other hand it also forces us to acknowledge the privileges that come with intersecting identities (eg. being white, able bodied, young, ‘straight’, …) There are always intersecting social identities, that entail systems of oppression and discrimination, but also come with several privileges. In an analysis of intersectionality, we also discover similarities in the systems of oppression (‘othering’ the oppressed, denying individuality, objectification, …). A better understanding of these mechanisms, can help us combat oppressions and injustice, of humans and other animals. The struggle for social justice cannot be a single-issue. One cannot fight against racism, without acknowledging the intersections with sexism or ableism. One cannot oppose ableism, without acknowledging the discriminatory influences of other oppressions like racism or sexism. This is also true for the fight against speciesism. We cannot advocate for other animals while perpetuating the same discriminatory processes that lead to injustice in society. This does not mean that animal rights or vegan campaigns can no longer have animals as their center focus. But we should realize that acts of injustice towards animals do not happen within a social vacuum, and we can only address that injustice properly when also taking the discriminatory and priviliging processes that shape our lives into account. For example, we must acknowledge that ‘go vegan’ campaigns will be received differently among wealthy or poor groups, and veganism may not be so easy to put into practice in so called ‘food desert’ areas, where there are hardly any shops that sell fresh vegetables and fruits. Next to acknowledging that veganism is a social justice issue, the concept of intersectionality must be addressed when designing effective vegan strategies. Furthermore, it forces us to address and fight the discriminatoy processes within the vegan movement itself, reiterating many of the same discriminatory mechanisms of society, and priviliging able bodied, young white males. 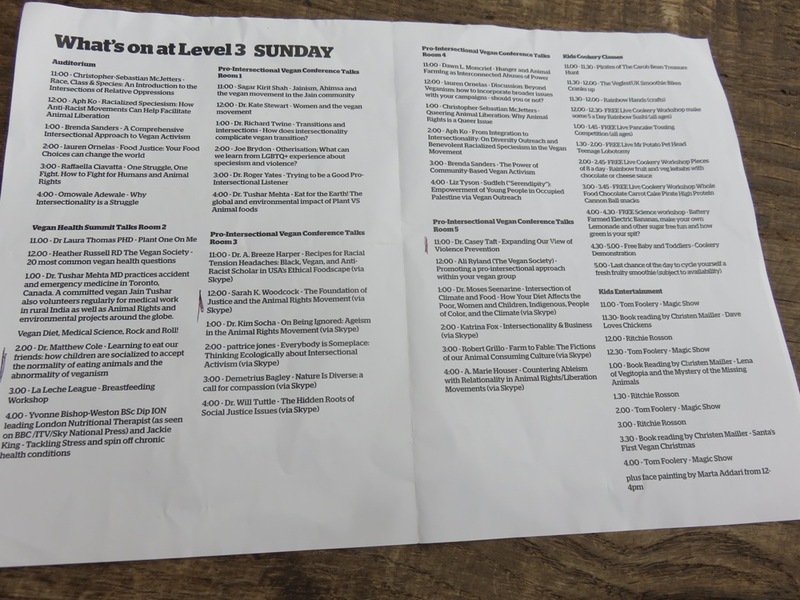 With 6 time slots and talks scheduled in 6 different rooms, it was very difficult to choose which lectures to attend! We split up and each attended different talks. The first talk in the main auditorium, for a packed audience, was by Christopher Sebastian McJetters: Race, Class Species: An Introduction to the Intersections of Relative Oppressions. His talk was enjoyable to listen to, inspirational and came with many illustrations (one of them hitting close to home, being the well known photo of a little African girl in the ‘human zoo’ at the World Fair in Brussels in 1958). McJetters emphasized that what units all discriminations (all -isms) is in fact “white male dominance“. Movements and organisations tend to focus solely on their respective victim status, but not on this “absent referent” of the oppressor (white patriarchy). One cannot claim that the fight for human rights has no link to the fight for animal rights: they are rooted in the same system of white patriarchy and both should strive to make this absent referent visible and combat it. Brenda Sanders’ talk The Power of Community-Based Vegan Activism was a very enlightening perspective of someone with hands on experience in vegan activism (PEP foods) in one of the poorest neighbourhoods of Baltimore. A combination of social community work and promotion of veganism: bringing people together, and letting them work together on social projects, while also providing information about veganism and serving vegan meals. And when providing vegan food, take note of what they like to eat and their culinary background, potatoe wedges can be more appealing to some than salads! Lauren Ornelas (from Food Empowerment project) talked about how Your Food Choices can Change the World. A just food system is not just about the end product and making plant based goodies. We also need to look at the working conditions of people in the food industry. Vegan campaigners sometimes point to the deplorable conditions that slaughterhouse workers have to work in, as a common ground to fight this speciesist system. But similar exploitative working conditions for humans also exist in the tomato and cotton fields. A striking example is the use of child slavery for the production of chocolate. Do not say your vegan food is “cruelty free” when it is the product of slavery. It did make me think about the chocolate I bought the day before, and that we should be paying more attention to the human exploitation aspect in the production (and consumption) of vegan products. 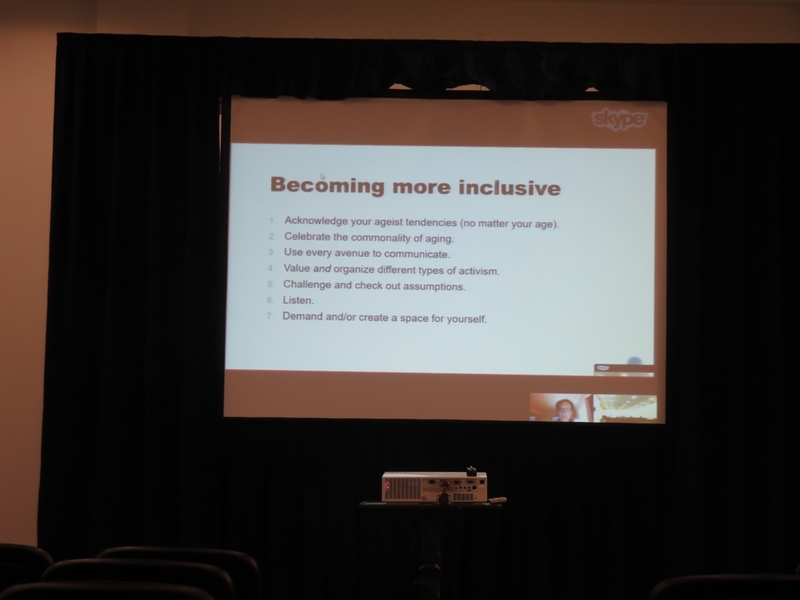 Kim Socha gave a talk (via Skype) On Being Ignored: Ageism in the Animal Rights Movement. I found this really interesting (maybe also because I am nearly 3 decades older than a lot of the people I see in the vegan community, so I can relate 😉 Ageism is an issue that is often overlooked when looking at interecting forms of oppression. Ageism is a form of discrimination and prejudice, particularly experienced by seniors (although it can also pertain to other age groups, like the very young). Touching upon the connections of ageism with ‘looksism’ and ‘ableism’ (some sad quotes from Nick Cooney as an example, see one of the slides below) Socha gave examples of how this discriminatory practice is also prevalent in the vegan/animal rights community. “As you get older in the Animal Rights Community, you become invisible“. This happens on many fronts: the campaigns are mostly aimed at younger people (sometimes just by using technology that is inaccessible for a lot of older people, like social media), the social activities are more appealing to youngster than elderly people (eg potlucks), and the forms of activism are generally more accessible to able bodied, younger people (eg demos where one has to stand outside for hours on end). Also, playing into the hands of social stereotypes of beauty, vegans are preferably portrayed as young and ‘attractive’ by mainstream organisations. Other talks that we attended were Raffaella Ciavatta from Collectively Free (One Struggle, OneFight. How to Fight for Humans and Animal Rights) with many examples of joint human and animal rights campaigns and actions, and Casey Taft from Vegan Publishers (Expanding Our View of Violence Prevention) how intersectionality should be taken into account in violence prevention. And Richard Twine (Transitions and intersections – how does intersectionality complicate vegan transition?) with an interesting application of ‘practice theory’ and how this determines an easy or difficult transition to veganism. At the end of the afternoon, I would have loved to attend the talk by A. Marie Houser about ableism (Countering Ableism with Relationality in Animal Rights/ Liberation Movements), but I was too knackered by that time, oh the irony ;-). Most of the talks of the Pro Intersectional Conference were recorded, and you can see them here. Next to the lectures of the intersectionality Conference, we also attended a lecture by snooker player Peter Ebdon (both of us being life long snooker fans), which was titled Why are so many snooker players going Vegan? (on Saturday) This was perhaps maybe our only disappointment of the festival. First, the title did not reflect the content of the speech. He recounted a lot of anecdotal stories of people being cured by following his dietary advice, but hardly any insights about other snooker players. Moreover, his talk transpired a very strong ‘the right diet cures everything‘ attitude (while there are so many other factors determining people’s health, like genetic predisposition, environmental factors and lifestyle) and on some points came across as very culpabilising to people living with chronic diseases (as in ‘it’s their own fault’). I also went to the lecture of Matthew Cole: Learning to eat our friends: how children are socialized to accept the normality of eating animals and the abnormality of veganism. A packed room and a very interesting research, showing (among other things) how the dominant speciesist look at animals is already formed in childhood, through children’s toys and children’s books. See the book Our Children and other animals. the cultural construction of human-animal relations in childhood (M Cole & K. Stewart, Routledge, 2014). 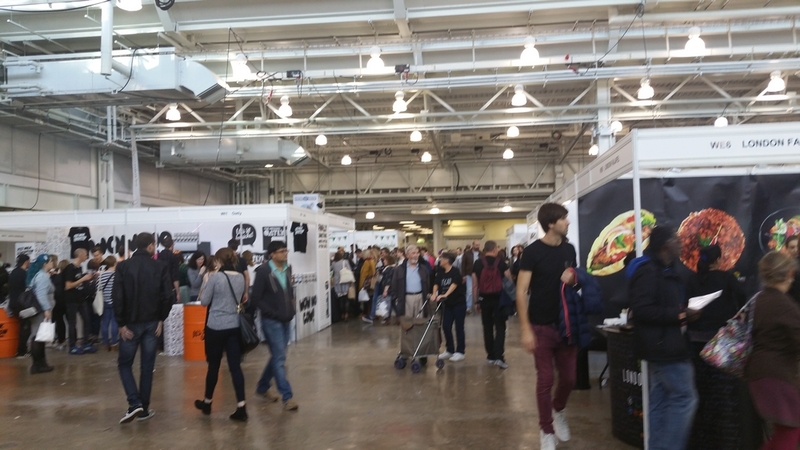 Although VegFest is a a big fair with loads of vegan products, the intersectionality talks certainly made it clear that veganism is not just about vegan products or what you put in your mouth. But about a fight for justice for all. 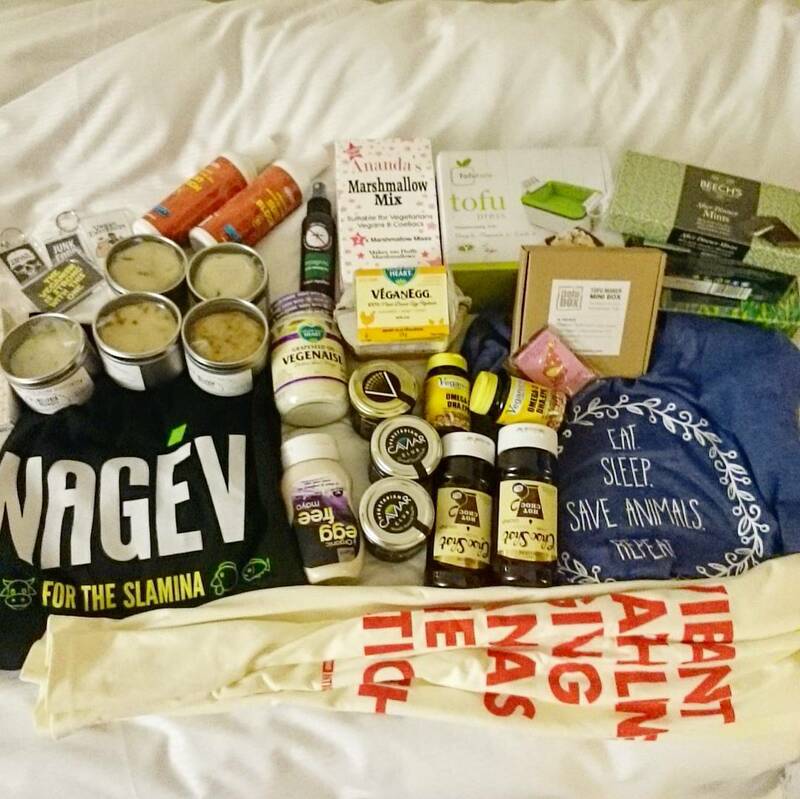 I was physically exhausted after two days at Vegfest, but it was mentally so empowering. We were truly inspired and motivated by the talks and the atmosphere. When confronted with the massive suffering and discrimination of humans and other animals everywhere, feelings of despair and hopelessness can sometimes creep in. The positive vibe at the festival and being together with so many other people sharing these same ideas is truly uplifting. I feel like that is the real upshot of such events. I had the same positive feeling after attending the first Minding Animals Conference in 2009 (in Australia), which made us go vegan. One can hear the talks online, read about it in books and articles, but being surrounded by thousands of people who share your thoughts about animal rights, veganism and social justice, hearing the proponents of the movement make a case for social justice, makes it that more tangible and empowering. It was awesome! Wow what a comprehensive account of your exhausting two days. Well done. I am like you I don’t need to see any more photos videos etc of animal cruelty to know it’s out there. I just do what I can to donate to very good charities and offer my time when I can. Again great post. Thanks SueT唐 梦 琇. Yes it was exhausting, but so inspiring ❤ Such a positive vibe. The iAnimal footage was special, and I wanted to experience it for myself, because of the 360° degree efffect. I hope it can open lots of eyes and hearts and inspire people to go vegan! Very, very inspiring post. A lot of things to learn from. And yummy pictures. I take exception to McJetters’ thought that what unites all discriminations (all -isms) is in fact “white male dominance”. I experienced a lot of racism against darker-skinned people in Northern Africa and in India, not from white males, but from North-African and Indian males and females. And it is a well-known historical fact that the Arabs were racists before Europeans became racist. Turning to discrimination of species (speciecism), go have a look in China and South-East Asia. The Chinese (males and females) are the champions of speciecism, not white males. When it comes to lesbian and gay discrimination, some black women in Uganda can be just as vicious against the LGBT community as some white men in Hungary (just to name but two countries). This “white male dominance” theory is taken from socialism and feminism, but one cannot transpose it to whatever kind of discrimination without gross oversimplification. We can find serious forms of discrimination in all cultures and all eras. Thanks for your feedback Dirk! I get your point. Indeed cultural/historical context should always be taken into consideration. I think all -isms being rooted in white male dominance is certainly the case in modern Western culture, which is the dominant culture in large parts of the world. At least that is how I interpret it (can’t remember whether this was discussed in the lecture or not). Excellent, very thorough reviews, thanks Trudi! Thanks also for posting the links to the videos of the conference; I’m so glad we can watch them too. Sounds like an amazing conference; very practical and thought-provoking. I feel similar to the “Taking Action for Animals” conference that happens in DC every year, though it’s much much smaller. But I like leaving a conference with a head full of constructive ideas! Thanks for your feedback Kristen, yes, it really was a motivational boost! Wonderful, thorough review of what sounds like a very interesting event. Most vegan events are focused solely on the food and perhaps a discussion of the animal rights issues that prompt most people to become vegan and I’ve often found this sort of thing to be very limited. Discussion, interdisciplinary work, and holistic information on the other hand is quite interesting because it makes you examine your choices and your reasons for your opinions. Thanks so much for such a thorough review; I’m so glad you were able to attend this – and obviously get a lot out of it. thanks for your feedback Meghan. the combination with the pro-intersectionality conference was indeed exactly the reason why I wanted to attend VegFest in London. I wish there were more events like this!